The author uses Theodore Dreiser's observations in North Manchester as a springboard to do further research on "Tent Chautauqua" in North Manchester. See NMHS Newsletter issues, May 2009 and August 2009. On Monday, June 21, 1915, Vice President Thomas Riley Marshall, who was born in North Manchester, dedicated a new stretch of the Lincoln Highway in northeastern Indiana. Arches with lights had been erected in Fort Wayne at the city limits marking the corridor. Signs on the high arches proclaimed the population of Fort Wayne to be 80,000. [See The Lincoln Highway Across Indiana, 2009] According to the local newspaper, "The city was gaily decorated with flags and bunting and the American flag waved from every public building." [Fort Wayne News Sentinel, June 21, 1915] 769 decorated cars, not including motorcycles and bicycles, were in a long parade. The famous Black Horse troop of Culver Military academy made an appearance. V.P. Marshall rode with his wife in the parade and it was reported, "all along he was given a tremendous ovation." The route of the parade was through the city of Fort Wayne, from Swinney Park to New Haven over the Lincoln Highway. Marshall then delivered the principal address on the campus of Concordia College, with Judge Olds (Marshall's friend and former law firm mentor ) presiding. Marshall then paid tribute to the memory of Abraham Lincoln, declaring that a more appropriate name for the highway dedicated could not have been selected. [Fort Wayne News Sentinel, June 22, 1915] The vision of a transcontinental highway had been promoted by Carl Fisher, the co-founder of the Indianapolis Motor Speedway. [Barbara Quigley, "Going West -- The 1913 Indiana-Pacific Automobile Manufacturers Association Tour," Traces of Indiana and Midwestern History (Winter 2006), p. 23] In the parade, Fisher had ridden in the first automobile and Marshall and wife Lois in the sixth car. In all likelihood, Theodore Dreiser and his traveling companions from New York City passed through the above mentioned arches almost two months later in the summer of 1915. Rather than follow the early path of the Lincoln Highway along what today is U.S. 33 in the direction of South Bend, Dreiser and Franklin Booth headed for Warsaw, and later North Manchester. As mentioned in Dreiser's A HOOSIER HOLIDAY, some of his mother's Snep relatives lived just north of North Manchester. [See NMHS Newsletter, Feb 2009.] Uncle Martin Fruitt and wife (sister to Dreiser's mother) are buried just outside Liberty Mills. Martin had died in 1899; Dreiser's aunt died in 1907. Uncle Martin's brother Christian Fruitt died August 18, 1914. Christian's wife Frances (Snell) died during Chautauqua Week on August 21, 1915, at the home of her daughter, Mrs. Joseph Cripe. 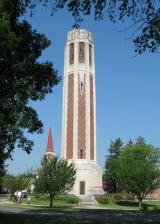 While Dreiser did not elaborate on some family connections in his writing, he did attempt a somewhat colorful description on several pages in A HOOSIER HOLIDAY of some encounters he had while passing through North Manchester. Encounter 1—Dreiser, pages 339-340: "To the curb in front of another grocery store as I was coming back to the hotel [Sheller]drew up a small, rickety buggy—so dilapidated and antique, scarcely worthy or safe to be hauled about rough country roads any longer. In it were "my Grandfather Squeers"—jackknife legs and all—and his wife, a most spare and crotchety female, in a very plain black dress, so inexpensive, a grey linseywoolsey shawl and a grey poke bonnet. She looked so set and fixed and yet humanly interesting in her way." "He still chewed a dime's worth six days of the week, While the seventh he passed with a chew in each cheek….He was fond of tobacco in manifold ways, And would sit on the door-step of sunshiny days, And smoke leaf-tobacco he'd raised strictly for The pipe he'd used all through the Mexican War….No Old Settlers' Meeting, or Pioneers' Fair, Was complete without grandfather Squeers in the chair, To lead off the program by telling folks how He used to shoot deer where the Court-house stands now'—How he felt, of a truth, to live over the past, When the country was wild and unbroken and vast, That the little log cabin was just plenty fine For Himself, his companion, and fambly of nine!" Encounter 2--Dreiser, page 339: "As I went up the street this early morning with my letters I encountered an old man, evidently a citizen of importance—present or past—being led down by his daughter (I took her to be). …He was blind, and yet quite an impressive figure, large, protuberant as to stomach, a Henry Ward Beecher, long, snow white hair, a silk hat, a swinging cutaway coat of broadcloth, a pleated soft-bosomed shirt ornamented with a black string tie, and an ivory-headed cane. Under his arm were papers and books. His sightless eyes were fixed on nothing—straight ahead. To me he looked like a lawyer or judge or congressman or politician—a local big-wig of some kind yet stricken in this most pathetic of all ways. The girl who was with him was so intent on his welfare. She was his eyes, his ears, his voice, really. …'Who is that man? ', I asked of a grocer clerk putting out a barrel of potatoes. `That? Oh that's Judge Shellenberger—or he was judge. He's a lawyer now for the Monon, a railroad that runs through here. He used to be judge of the circuit court.' …Life is so full of great tales—every life in its way a masterpiece if seen in its entirety and against the vast background of life itself." Dreiser's penchant for developing composite characters contributes to creative, yet fictitious history. There was no Shellenberger who was a local "bigwig" or member of the bar at that time in Indiana. [See Courts and Lawyers of Indiana, 1916] He perhaps did encounter sightless John Ridgley who was a local Civil War vet, aided by his daughter Audrey Henney. In any event, it seems odd that Dreiser chose to couple a sightless person with an armload of papers and books. Dreiser had arrived just before Chautauqua Week was to start in our town. As a featured Chautauqua speaker, silver-haired Ashton C. Shallenberger had been shown in prominent photographs in the local newspaper, North Manchester Journal (July 22 and August 12, 1915). In the photos, Shallenberger fit Dreiser's sketch of the described person, "quite an impressive figure, large, protuberant as to stomach, a Henry Ward Beecher, long, snow white hair…and an ivory-headed cane." But Ashton C. Shallenberger was not blind! There was a noted blind speaker on the Chautauqua circuit that summer, namely Congressman Gore from Oklahoma. But Shallenberger was the one speaking in North Manchester, not Gore. Ashton C. Shallenberger was then Congressman from Nebraska. In 1908 he had been elected governor of Nebraska receiving a majority nearly double that of William Jennings Bryan. Shallenberger was the only Democrat ever elected from his district to the U.S. Congress, and the second Democratic governor of Nebraska. He was a noted orator, and had a knack for getting the crowd with his first amusing story. He also appealed to farmers because he supported the first rural credits bill. Page 341: These streets of North Manchester were hung with those same triangular banners—red, white, blue, green, pink, orange—which we had seen in the East and which announced the imminence of a local Chautauqua. …In the store windows were quite striking pictures of Stromboli, the celebrated band leader, a chrysanthemum haired, thin bodied Italian in a braided white suit….And adjoining him in every window was the picture of Madame Adelina Scherzo, the celebrated soprano prima donna straight from the Metropolitan Opera House, New York. Page 342: Madame Scherzo was in black velvet, with bare arms, shoulders and throat, an entrancing sight. She was rather pretty too, and a line under the picture made it clear that she was costing the management "$800.00 a day," a charge which interested me, considering the size of the town and county and the probable audiences which could be got out to see anything. Drama Night: William Owen and cast in a modern play, "The Servant in the House." Health and Happiness Day: Lectures by Dr. Charles E. Barker, who was physical adviser to President Taft during his administration in Washington. Band Day: Francesco Pallaria, dynamic, dramatic and spectacular director and his band. Popular Science Night: Wrestling gyroscope, monorail car in action, handwriting on the wall by ultra-violet rays. A thrill and surprise every minute. Patriotic Day [August 25]: Ex-Governor Shallenberger of Nebraska, newly elected member of Congress, in a great address on "political Patriotism." Joy Night: Rollicking fun, music and enthusiasm. Don't miss this feature. Alice Nielsen Day [August 26]: Recital by Prima Donna Soprano of the Metropolitan and Boston Opera Companies. Greatest musical feature ever announced on a Chautauqua program. The play, "The Servant in the House", had just been introduced in the 1915 Chautauqua circuit. This play was first produced in 1908 and had been a long-run hit on Broadway. William Owen was the leading man in the wholesome Chautauqua drama; he was twenty-three years of age. Owen and the other actors were acclaimed and seasoned actors; Owen had established a reputation playing Mephistopheles in Faust on the Great White Way. Written by Charles Rann Kennedy, this play was known as a modern morality play in five acts, Stressing wholesome values, humility and the love of a father for his child, the play's words and themes did not upset or undermine the values of the Chautauqua belt, including those of North Manchester. There were never very many athletes represented in the Chautauqua troupes which travelled the country. A fast runner once talked on the subject of The Spirit of Sportsmanship. Baseball owner Branch Rickey on one occasion covered Business and Baseball. "Farmer" Burns, former heavyweight champion wrestler of the world, gave talks on good health and clean living. John L. Sullivan, the former heavyweight boxing champion spoke on Temperance. Such celebrity appearances took place in other communities. Here in North Manchester in 1915 Dr. Charles Barker, a former gymnast, showed up and reportedly could jump over a pile of chairs on the stage. Barker went on to demonstrate with exercises, dumbbells and chairs what he had prescribed as physical adviser for President Taft to lose weight! Madame Adelina Scherzo, the name was possibly another playful Dreiser reference to the remarkable musical talents of this singer. "Sweet Adeline" was a popular tune (1903) shortly after Dreiser placed lyrics to his brother Paul's music (1897) "On The Banks of the Wabash." The parents of Alice Nielsen had met in South Bend, Indiana when her mother Sara Kilroy was studying music at St. Mary's College. Born in Nashville, TN, on the seventh day of the month, the seventh daughter of a seventh daughter (as she liked to recall when interviewed), Alice Nielsen became a Broadway musical star around the turn of the century, eclipsing her friend Lillian Russell. She studied opera, made her grand-opera debut in Naples (Italy), sang opposite Caruso in London, and debuted in major American cities, including Boston and New York City. Nielsen then began participating in the popular Chautauqua tours, singing to more people than could be gathered in an opera house. 1915 Contract between Redpath Chautauqua and North Manchester. Those who signed the contract for North Manchester agreed "To subscribe and pay for seventeen hundred and fifty dollars ($1750.00) worth of season tickets of admission to said Chautauqua Assembly at two dollars and fifty cents ($2.50) per ticket, on or before one day prior to the opening of the Chautauqua Assembly." The season ticket enabled the purchaser to attend any or all the sessions. Tickets for children between the ages of six and fourteen could be sold for one dollar and fifty cents ($1.50) each. Without the season pass, one could pay admission for single events, as had been mentioned by Dreiser. According to Redpath Chautauqua's financial records, the total ticket sales in North Manchester for August 19-26, 1915, were $2268.10, including advance season tickets of $1750.00 and single tickets totaling $518.10. The original signed contracts and financial records are located in the Archives at the University of Iowa, Iowa City. During the month of August in 2009, ninety-four years after Theodore Dreiser's visit to our town, my wife and I were privileged to view and research the nearly 700 linear feet of Chautauqua Circuit files, the nation's largest collection of its kind. These records include the office files of the commercial lecture bureau and booking agency for Chautauqua and Lyceums throughout the U.S. and parts of Canada. The Redpath Chautauqua Collection in the Special Collections Department, University of Iowa Libraries (Iowa City) consists of talent files, correspondence, contracts, publicity brochures, advertising flyers, business files, location files with materials about sponsoring cities and towns;, photographs, daybooks and cash books, reports by platform superintendents and advance men; etc. Chautauqua's Roots. The Chautauqua experience had developed from the Lyceum movement of the nineteenth century. 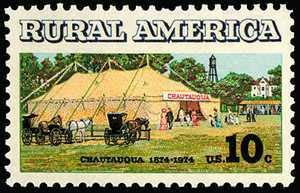 The first Chautauqua Assembly was held in western New York in 1874. President Grant was present for the second Assembly in 1875, and his presence gave impetus to ensuring prominence for the Chautauqua movement. In 1876 the Chautauquan, a monthly magazine, was established. Chautauqua's founders believed that education must be exalted: "The whole of life is a school. …Education, once the peculiar privilege of the few, must become a valued possession of the many. "9 The North Manchester Journal (July 22, 1915), as reprinted from the Merchants' Trade Journal (Des Moines, Iowa): "…The original idea of the Chautauqua movement was to bring noted teachers, men and women who have accomplished things into the community where the people might receive teaching and inspiration from them first hand. But this movement has grown until now our Chautauqua has become the great American forum, where the public meets to hear discussed problems and questions of moment. It has become a place where the reformer, the politician, the educator, finds open minds to receive his teaching and theories." Even though Methodists founded the Chautauqua movement, nondenominationalism or what William Jennings Bryan once called "a sane catholicity"10 was a striking characteristic of the Chautauqua platform and the operative principle in its development. Bryan appeared on more than three thousancd Chautauqua programs and was paid up to $25,000 per season. In some ways, the movement served as a secular extension of the earlier religious camp-meetings. "Saving souls", unreasonable sectariansim and razzle-dazzle evangelism were not identified with Chautauqua. On the Chautauqua circuit, the citizens were not urged to "walk down the sawdust trail" in a tent. Billy Sunday's evangelistic tours were independent of Redpath-Chautauqua booking. Stimulating the mind was ultimately Chautauqua's secular function, offering exposure to education, the arts, music, poetry, recitations, the latest developments in the sciences, politics, travelogues, the world of ideas, patriotism, peace and social issues such as suffrage, temperance and prohibition, child labor, racial and economic divides. President Theodore Roosevelt once called the Chautauqua "the most American thing in America." William Jennings Bryan considered Chautauqua as a "potent human factor in molding the mind of the nation." The Chautauqua movement combined education with entertainment in the form of concerts, plays, lectures usually held in a large outdoor tent. Americans were thirsty for culture, hungry for information, and looking to be entertained. They wanted edification, they wanted to be uplifted, they wanted to laugh, they wanted to be festive. Moreover, the merchants welcomed the crowds! Chautauqua was a much anticipated annual summertime event in communities such as North Manchester, and the local newspaper always promoted the event several weeks in advance. The Big Canvas Tent. The large brown tent was erected usually on the grounds (northwest corner) of the Central School. An exception was made in 1922 and 1923 while a new building was being constructed. The grounds chosen in 1925 was land owned by U.R. Young, southeast of Bond and Third Streets. The Chautauqua tent was made of heavy duty brown canvas material. The tent size was 70' x 140'. Since the stakes extended 10 feet on the sides beyond the tent, the minimum lot size needed was 90' x 160'. When it was impossible to get everybody into the tent, the canvas sides could be rolled up and hundreds more sat outside. In raising the tent in the outdoors, the people no longer were confined to a church building, the Knights of Pythias hall on Walnut Street or the opera house on Main Street. The stage was set outdoors under the "big top" canvas. The extensive railroad system facilitated the transport of Chautauqua troupes and Chautauqua ideas from state to state, town to town. The traveling Chautauqua circuit had commenced in 1904 in Iowa under the business tutelage and management of Redpath's successor Keith Vawter. These records for the traveling circuit were eventually bequeathed to the University of Iowa. The circuit Chautauquas and their booking agencies were independent of the Chautauqua Institution on Lake Chautauqua in western New York. As I was delving (July 13, 2009) into the research files at the Oliver Archives Center on the beautiful grounds of the Chautauqua Institution, Jon Schmitz, the archivist, pointed out that a split had developed between the two in their respective approaches or emphases. Those associated with the parent Chautauqua Institution often considered themselves more urbane, articulate and cerebral, while frequently viewing several of the circuit performers as "bumpkin entertainers." Tent chautauquas finally lost their luster. Financial underwriting was a challenge. It became increasingly difficult to maintain a high level of quality in the talent pool. Too many tents contributed to a shallow talent pool! The Cultural Caravan fell victim to the Great Depression and other competing attractions such as the automobile, radio, Hollywood and the movies. School associations drained Chautauqua-type talent when they started to send speakers, artists and performers into the primary and secondary schools. The Chautauqua Cultural Caravan was challenged by the fierce economic downturn in the 1930s, and also by new technologies, new organizations and changing interests. Researching Chautauqua. It was reported in the North Manchester Journal (July 30, 1914) that postal card views of Chautauqua were distributed along with a liberal supply of banners, pennants, window cards and programs. I have not yet found postcards or photographs of the local annual chautauquas. The Center for History has been given some Chautauqua ephemera in scrapbooks (from the collections of Liegh and Florence Freed) including a few original printed programs. Please notify the Center should you happen to know where other items exist pertaining to the Chautauqua phenomenon, including photographs, sketches or other artwork of the Chautauqua tent, trains, banners, posters, performers, audience and festive crowds in North Manchester during the period of 1913-1930. Uncovering additional details from diaries, written correspondence, or first-hand memories would also be greatly appreciated! 1 Ulrey's letter, January 9, 1915, in Redpath Chautauqua Collection, Special Collections Department, University of Iowa Libraries, Iowa City. 2 See Dreiser, A Hoosier Holiday, Chapter 42, "In the Chautauqua Belt." 3 James R. Schultz, The Romance of Small-Town Chautauquas, 2002. 4 Guy Templeton, "The People's Prima Donna" in Redpath Chautauqua Collection. —The Story of Tent Chautauqua, Hastings House, 1958. 6 Redpath correspondence, July 22, 1916, in Redpath Chautauqua Collection. 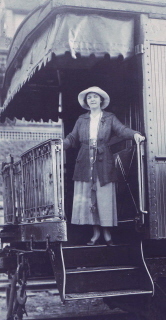 7 Alice Nielsen's contract, 1915 photograph of her on steps of private Pullman car and itineraries in Redpath Chautauqua Collection. 8 Town contract with original signatures in Redpath Chautauqua Collection. Contracts between the town of North Manchester and Redpath Chautauquas were found in the archives/special collections of the University of Iowa for the following years: 1914, 1915, 1918, 1922, 1923, 1924, 1925, 1926, 1927, 1928, 1929. 9 John Heyl Vincent, The Chautauqua Movement, 1881. 10 W.J. Bryan, "The Nation-Wide Chautauqua," The Independent, July 6, 1914. 11 McClarran Collection, Box 463, Oliver Archives Center, Chautauqua Institution, New York. 12 North Manchester News, July 11 and 18, 1918. 13 Letter, December 2, 1921, in Redpath Chautauqua Collection. 16 South Whitley hosted five-day tent chautauquas for several years. 18 Letter, July 2, 1918, in Redpath Chautauqua Collection. 19 Gordon's Report in Redpath Chautauqua Collection. 20 Letter, August 8, 1928, in Redpath Chautauqua Collection.